Never underestimate the value of a good folding shovel. The convenience and safety these tools bring cannot be stressed enough. If you have never seen a folding shovel, check out this video. This is a video of a generic folding shovel that will show you what they are all about. Depending on the type of shovel you buy, you can be prepared for almost any eventuality on the trail. Below is a list of situations where a shovel could come in handy. Clearing snow so that you have a path to walk. Digging mud from under your tires so you can unstick your vehicle. Covering the embers of a fire when you want to break camp. Moving objects out of your path that you don’t necessarily want to touch with your bare hands. Clearing rocks from under your tent. Digging a rain trench to prevent water getting into your tent. As you can see from the above list, a shovel is an invaluable tool, arguably one of the most important pieces of equipment you will ever buy for the trail. For this reason, choosing the right shovel for the jobs you anticipate yourself doing is a must. Shopping for a folding shovel can be very confusing. There are a large variety on the market, and picking the one best suited to your needs is only the first step. That’s where we come in. By the time you’ve finished with this article, you’ll understand something about the history of the folding shovel as well as why modern folding shovels are more practical for camping and hiking than ones that don’t fold. We will also have a brief discussion of the design of the folding shovel. After that, we will teach you how to properly care for a camp shovel and review the best ones on the market. If you still haven’t settled on the right folding shovel for you at that point we’ll round out the article with a buying guide to help you out. 4 Why Are Folding Shovels More Convenient for Hikers and Campers? Entrenching tools have existed from times as early as the Roman conquests, and maybe even longer. Back then, they were a simple plate of metal with a hinge and a handle if they folded at all. Most of these designs didn’t fold and were simple spades. However, they were the ancestors of the modern folding shovel we know today. The design for the modern folding shovels of today came into existence sometime after World War I. The heavier, bulky entrenching tools were redesigned, making them lighter and more compact. That, in turn, made them less unwieldy. Many of these folding shovels were just flat shovel heads on handles with very simple hinges, perhaps including a pick or spike into the design for prodding land mines. These implements were carried as part of an infantryman’s gear so they were designed to be lightweight. In fact, such shovels are still carried by the military today. These are generally of an all metal construction, durable, lightweight and strong. The civilian popularity of these tools can be attributed to their use in the military. Surplus units have come into circulation in contexts other than warfare, and they are now carried by hunters and hikers everywhere. If you are a gardener, it is even a good idea to have a folding shovel among your garden tools as they are more lightweight than your typical gardening shovel. The modern folding shovel is a very versatile piece of equipment. 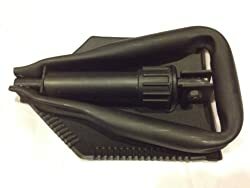 It may even come with other tool attachments, adding to its usefulness immensely. For example, an entrenching tool today might include a pick axe, a saw blade, a compass or even a flint for starting a fire. In short, they are a bit like the Swiss army knife of shovels. These special tools are accessed in some ways. In some shovels, you must turn the head to reveal the extra tools. However, some folding shovels for camping also have detachable heads which allow you to attach a separate tool altogether. As for the shovel design itself, many shovels either fold down into small spaces or collapse for easy storage. Some can even be taken apart and stored in pieces, allowing you to reassemble them when needed. The blades on these shovels are usually not the type of blade you expect to see on a typical shovel. Some examples of this include such things as serrated edges for cutting, or sharp tips made for prying up stones and roots. With their versatility, it is probably easy to see why someone would want one of these shovels on a camping trip. However, there are more reasons than just the extra tools and specialized blades. Why Are Folding Shovels More Convenient for Hikers and Campers? If you are on a camping trip or hike, you want a shovel that will be light-weight and easy to carry. Folding shovels fit this need nicely. These versatile shovels have a variety of designs and compositions, but one thing remains the same. They are easy to attach to the top of your pack without weighing you down. Some of them even come with clips which allow you to attach them to your pack as opposed to slinging them over the top. They can even come with carrying cases to protect them from the elements. Regular shovels take up a lot of space. They aren’t appropriate for fitting on top of your pack when hiking or camping or under the seat in your vehicle. They are also heavy and unwieldy. Though you could carry one on a hike, you would likely not want to as it would require both hands. A further disadvantage of a shovel that doesn’t fold is that it tends to not be as versatile. A folding shovel’s head is usually designed to accomplish more than one task. As an example, a camp shovel could have a square tip for digging in hard-packed soil, while having a broad scoop for moving loose debris. There could even be special notched edges to remove snow or mud. Taking care of your camp shovel will help it last for years to come. It will also prevent breaking, warping and rust that could ruin your shovel. Whenever possible, wash and dry your shovel after each use. Certainly do this when you return home from your hike or when you set up camp for the night. Bring along a soft cloth. Use this to dry your shovel after washing. Putting away a wet shovel causes rust. If your camp shovel has a carrying case, always store it in the carrying case in a dry location. If the edge gets dull, sharpen it with a flat mill file. It’s a good idea to do this annually. If your shovel starts to get rusty, use a wire brush or 80-grit sandpaper to scrape away the rust. Oil your shovel hinges regularly. This prevents squeaking, rusting or seizing. If your shovel handle is wood, you can also oil that with linseed oil annually to prevent cracking or drying. Now that you know a little more about camp shovels, it is time to shop for some! Below are our recommendations for the absolute best portable shovels to stow in your pack or carry on a hike. This durable camping shovel is made entirely of tempered steel. When folded, it takes up about as much room as a stack of paper plates. Features a pick attachment behind the shovel blade. Turn the blade ninety degrees to reveal the pick. In this form it can be used as a hoe in combination with the shovel blade. Twist the blade one-hundred eighty degrees to use the pointed end of the pick. One edge has teeth for cutting and slashing. Ergonomic handle for easy use. Carry pouch for easy storage. 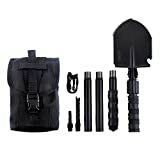 The size is not a standard entrenching tool size. Some units have bent under use. This shiny shovel comes in three eye-catching colors which make it easy to spot if it’s lost. It’s also incredibly easy to attach it to your pack when you hit the trails. Adjustable length from twenty-five to thirty-two inches. Weighs just a bit over a pound. Can be disassembled into three pieces for easy storage. Shovel can snap where blade meets handle on some units. This Gerber folding shovel is a must-have for any camper or hiker. It’s sturdy construction and serrated edge makes it perfect for digging trenches or removing roots. Gerber shovels are some of the best on the market. Folds up small for easy storage or transport. Handle is a bit short for some users. 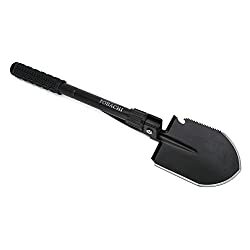 If you are looking for a military folding shovel with a lot of uses, this one would be perfect. It functions as several tools in one, and folds to nine inches long. Saw, mattock, shovel and axe all in one. Steel shovel head with aluminum handle. Durable construction with superior materials. Weighs a little more than some other shovels. Some units come with chipped coatings and no lubrication on the joints. This multipurpose shovel really does it all. If you need one tool that will perform every task, then this might be the one you’re looking for. Good for shoveling, prying, digging, sawing and even opening bottles. Anti-slip grip and ergonomic handle for comfortable use. Includes carrying pouch with loops so you can attach it to your backpack. 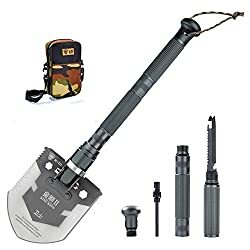 Excellent folding shovel for camping. Stitching on the carrying case might come out. This survival shovel is light-weight and portable. It is designed with campers, hikers and other outdoor enthusiasts in mind. Includes pick axe and fire starter. Is lightweight, making it easy to carry. Folds to be small enough to fit into your palm. Total weight is two pounds. Carrying case may not be durable. This shovel is longer than most in this list at a whopping thirty-one inches. This means you will not have to bend quite as far to use it which can be a huge advantage if you are using it in snow or don’t want to kneel. Constructed with the feedback of campers and hikers in mind. Strong enough to move rocks, snow or roots. Comes with a pick, fish scaler and other tools. Collapsable. Shovel head detaches to allow use of other tools. Shovel head may be hard to screw off for some users. This shovel is full of surprises. It comes with a fire starter, a knife, a compass and a whistle all built into the handle. Multi-purpose tool. Have everything you need at your fingertips. Made of a durable carbon steel. Longer haft than some shovels. Comes with a carrying bag which allows you to store not only the shovel bits and secondary tools but other things as well. Additional tubes to extend shovel can be purchased. The bag doesn’t close tightly. Some units have compasses that don’t work. 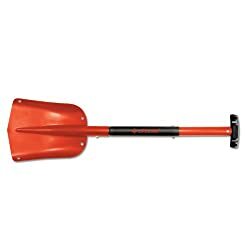 This shovel features a multi-purpose design and extra tools, making it perfect for hiking, camping, gardening and anything else you could possibly want a shovel for. It even comes with a carrying bag for easy storage and attaching to your pack or belt. Folds ninety degrees for use as a pick. Makes an excellent snow shovel. Pouch has only one loop. Good for a belt but not for your backpack. This fold-up shovel locks into place with an easy twist and features a head that will lock into multiple positions for ease of use. It also has an unfoldable pick which can be folded to not interfere with shovel usage. Steel construction makes this shovel durable. Now that you have seen our list of the top ten folding shovels, it is time to buy one yourself. However, there are some very important considerations to make before you head to the hardware store. 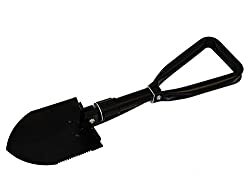 In this section, you will learn what you need to consider before buying a folding shovel. When you have finished reading, you should be able to pick out the perfect shovel for you. 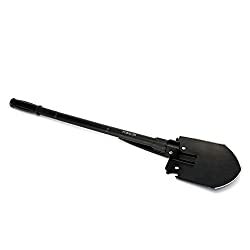 How heavy is the camping shovel you are considering buying? If you are going to carry it long distances, you’re not going to want something that’ll weigh you down. If it is light enough to not add over five pounds to the weight of your backpack, that is also a very good incentive to buy that shovel. Folding camp shovels come in a variety of sizes. You want one that will be small enough to fit easily into your backpack or to hang on your belt without getting in your way as you move. Does this shovel come with a carry bag? Not all shovels do, and this might be a problem. If you have a shovel holster of your own, then you might not need a bag. However, not all campers or hikers have a shovel case and not every shovel will fit every case. If the shovel does not come with a case, and you are going to have to buy one, it is a good idea to measure your shovel to make sure it fits or to buy the case from the same manufacturer if possible. What kind of holes do you plan to dig? If you are planning to dig large holes, use a military shovel. These shovels are meant to be sturdy enough to handle even hard-packed dirt with ease. A lower-quality shovel may bend or warp if used this way. If you plan on using your shovel simply for digging bathroom trenches or raking dirt over a campfire, you don’t need a larger, heavier shovel. A lightweight trowel will do the job nicely. Once you have figured out what kind of shovel you need, it is necessary to choose what sort of material it is made of. Each kind of material has its drawbacks. Plastic is a light-weight shovel-making material. It also doesn’t rust. However, plastic components aren’t very strong. Your shovel can break during use. Aluminum blades are stronger than plastic. Like plastic, they do not rust. However, aluminum can bend, break, warp or lose its shape if you use it on anything stronger than wet snow or cutting through ice. These are the shovels you should use to dig through a snow drift. Steel shovel blades come in three different types. Carbon steel is an alloy of steel and iron. It gives added strength to the shovel blade. Manganese steel includes the metal manganese. This metal is good at resisting shocks. Stainless steel contains a small amount of chromium. Chromium resists scratching and rust. Steel blades are the hardiest of all shovel blades. They can move rocks, hard packed dirt, mud, snow, sand and pretty much anything else. However, a steel shovel will cost more than an aluminum one. Furthermore, it is a heavier tool so prepare for a little extra weight in your pack if you opt for this option. Be aware what the lock collar and hinge bolts on your shovel are made of. Some shovels feature plastic bolts or collars. Over time, these collars and bolts could wear out. It is a good idea to buy camp shovels made with metal collars and bolts whenever possible. Some folding shovels come with extra tools for campers and hikers. Some of the possible tools included are compasses, fish scalers, fire starters, picks for moving rocks, and saw blades. As a general rule, these tools are great things to have. They lessen the number of items you have to pack into your backpack. In an emergency situation, the last thing you want is to have to be trying to figure out where you are going to find a flint to start your fire. Most folding shovels do not have long handles. They are meant to be used by someone who is kneeling to dig. 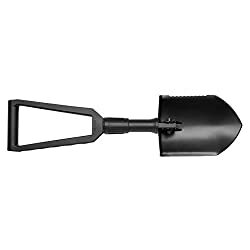 However, if you are very tall, or are someone who doesn’t want to kneel, some shovel manufacturers offer extensions, especially for collapsable shovels. These extensions are screwed onto the handle and can prove valuable, especially if you need more leverage while digging. You will never realize how much you need a good camp shovel until you are out in the woods without one. A folding shovel is great for a number of jobs around the camp. You can use it to dig rain trenches around your tent, dig holes for latrines and fire pits and even to dig roots and rocks out of the footprint of your tent. If it is winter, and you are driving out to the campsite instead of hiking out, your camp shovel can dig the snow or mud from under your wheels to give you the necessary traction to get moving again if you get stuck. As an added benefit, many camp shovels come with extra tools such as fish scalers, bottle openers, fire starters and compasses. All of these tools can come in really handy when you’re miles from civilization as well as freeing up storage space in your pack for other things. Buying a good camp shovel isn’t a hard process, but you need to consider things like the weight and size of the shovel you want as well as what kind of jobs you need it for. Though buying a folding shovel may seem daunting at first, it doesn’t have to be. Now that you’ve read this article, you’ll be able to pick the right one for any job.